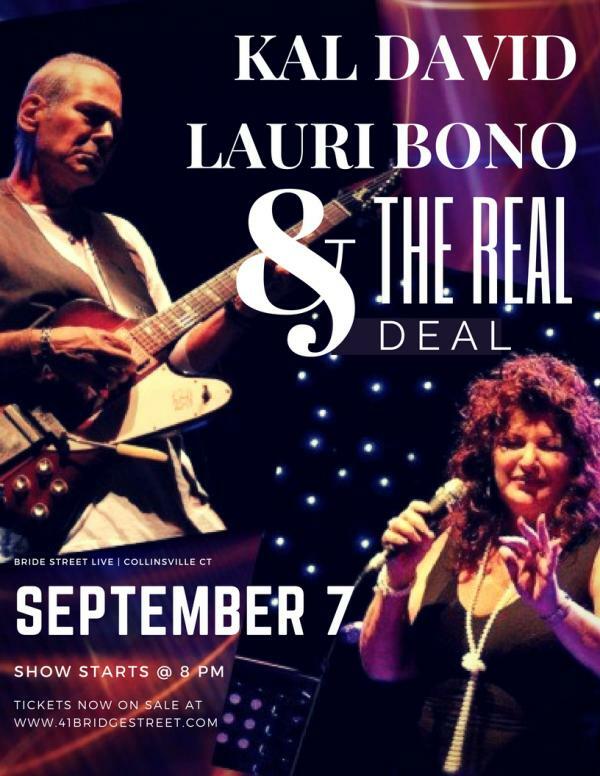 Bridge Street live is proud to present a special evening with Kal David & Lauri Bono featuring The Real Deal on Friday, September 7th at 8 PM. Kal David (Chicago, Illinois) is an American blues musician famous for his work as a guitarist, singer and songwriter with some of the world's preeminent blues musicians as well as for his work in the early 1970s on Columbia Records. As the former lead singer/lead guitarist of the Fabulous Rhinestones, lead guitarist of John Mayall’s Blues Breakers and Etta James’ Band, Kal is considered by many to be the finest blues singer/guitarist on the planet. To say that Kal David is just a great Blues guitarist would be a shame, although he is that, indeed. Other Blues guitarists don't come close to his wide range of styles, the colors on his palette. Kal David is a fine and experienced guitarist who can bring you to your knees with his soulfulness, but don't miss his depth. Kal David is a singer. A true vocalist, a professional with way above vocal chops. His gritty, yet polished vocals take you on an emotion filled ride. The world is about to wake up to a true living legend of music. Miss Lauri Bono, music and life partner of Kal David for many years, is a fully featured member of the band. She is an amazing and dynamic female vocalist. With Lauri, less is always more. Miss Bono sings in a way that she can sound like soft velvet or turn on the gravel and guts and then pull you right back into another soft passage. It a gift that she has chosen to share with Kal David as they travel the globe making records, playing concerts and major VIP events. Lauri Bono teamed up with Kal David musically when Kal asked her to work on a demo with him. But it wasn’t long before it turned into true love. At first Lauri thought, “No way. That’s not for me.” She was aware of his fanfare and after all, he was a rock and roll guy. But, as she shared, “We are soul mates, so it worked out for the good.” For 41 years they have been the exception to the rule in an industry that seems plagued with broken homes and hearts. There is something so special about the chemistry between these two artists. Although each can stand alone, they are a team. They work synergistically for the greater good of the performance or the complete record. There is no comparing who is better than the other, they exist because of and for each other......Perfect Harmony!! Lauri and Kal’s extensive credits look like the who’s who of the music industry. Working for long periods with Etta James and Johnny Rivers, then Lauri, performing with Bette Midler and Tanya Tucker and Kal doing a long stint with John Mayall and the Blues Breakers and also performing and/or recording with BB King, Peter Cetera, Paul Cotton, Smokey Robinson, Joe Walsh, Bonnie Raitt, John Lennon, Stevie Wonder, Brian Wilson, Paul Young, Robbie Dupree and a host of others If you have the opportunity, don't miss an electrifying Kal David-Lauri Bono performance featuring The Real Deal.